Update V, 4/16: My brother-in-law has a great set of photos from yesterday’s Denver event. Slapstick Politics has begun to post video from the well-attended festivities at the West Steps of the Capitol. Rossputin has some “Post-Tea Party Thoughts” that includes photos, video, and an interactive poll question. 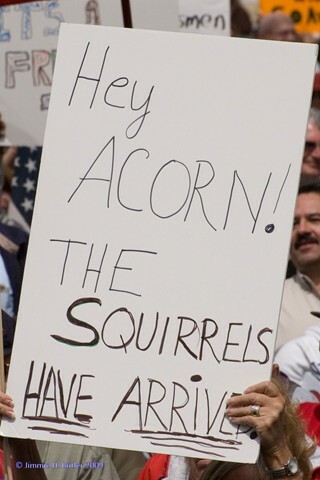 Here is a great site that is tallying attendance reports from Tea Party events all across the country. I’ve already notified the site operator with a few reports from Colorado locations he hadn’t yet received. 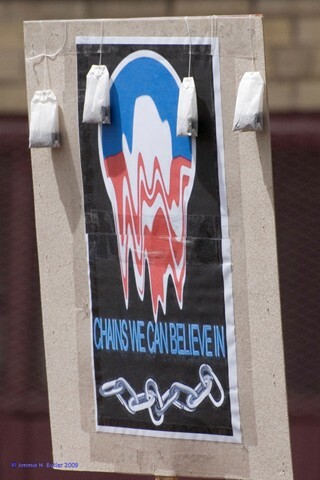 Update IV, 10:00 PM: Over at Free Colorado, Ari has a good initial analysis and a slew of pictures from Denver’s event. Face The State’s coverage and slide show can be found here. Zombyboy has a nice spread of photos and some interesting thoughts as well. 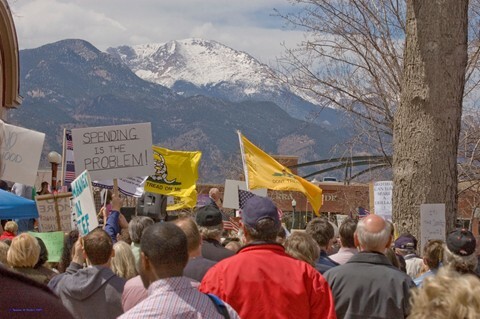 Over on the Western Slope, Gene Kinsey has posted pictures and more pictures from the Grand Junction rally, where he points out “more than two thousand” were in attendance. 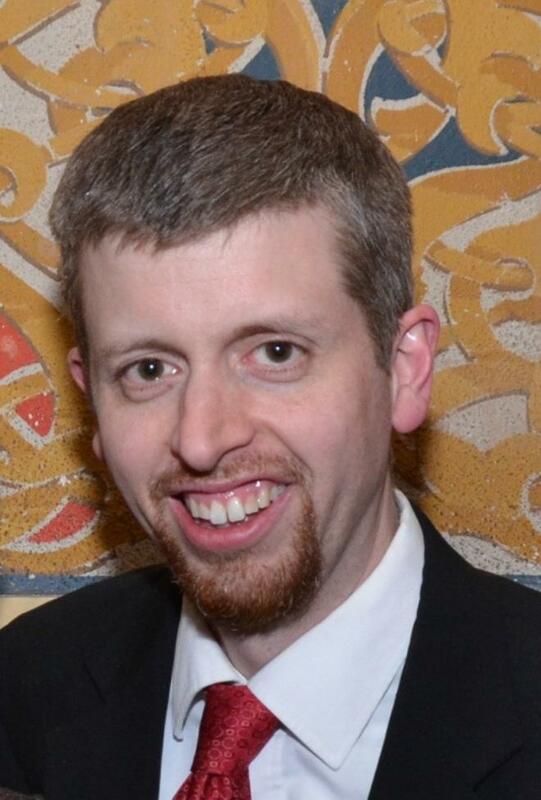 Thoughtful Phil Mella at Clear Commentary says he hopes Tax Day Tea Parties “are just the beginning of a great awakening”. What’s humorous is the Left’s weak attempt to dismiss the phenomenon by trying to paint it with the broad brush of a few off-message stragglers (diffused well by Ari Armstrong in this video) and using gutter sexual innuendo to insult everyday Americans showing up to vent their concerns at a family-friendly event. Lovers of liberty need only scoff at these half-hearted Saul Alinsky disciples. 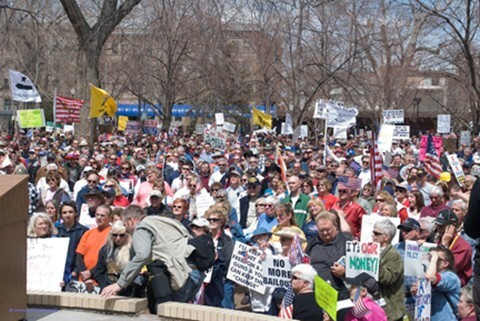 Update III, 3:45 PM: My source from Colorado Springs says about 4,000 people showed up at the Tax Day Tea Party rally there earlier today. 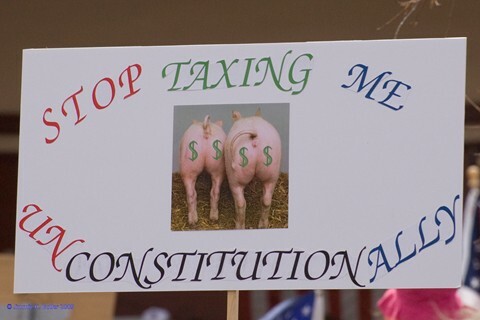 Update, 2:30 PM: Returned a little while ago from the Denver Tax Day Tea Party. It was HUGE. The Denver Post says “more than 5,000 people” were there, and I’d be hard-pressed to disagree with that estimate. People were flocking in and out. An upbeat crowd – enthusiastic, energetic, waving signs, cheering. No problems with Lefty disturbances that I could see. Stay tuned to this site and to the People’s Press Collective and Rocky Mountain Right for more coverage and photos of the event. Sadly, if the legislative calendar is to be trusted, it looks like the majority Democrats in the state house have opted to avoid debate on the budget (SB259) and Pinnacol theft (SB281 and SB273) today. Maybe that will give more lawmakers time to come out and visit with the concerned constituents coming to their doorstep today. We’ll see … Expect a follow-up report later.